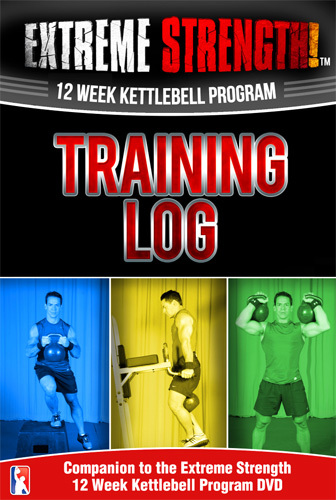 Take it to a whole new level with Steve Cotter’s all new, Extreme Strength - The 12 Week Kettlebell Workout! This incredible system is based on Steve’s own personal strength and metabolic conditioning program he uses and is an accumulation of years of knowledge training with some of the top Kettlebell athletes in the world. 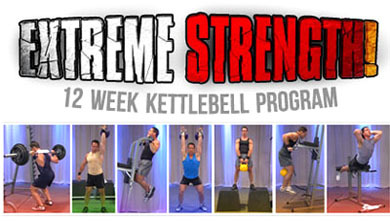 The entire Extreme Strength program follows 3 workouts per week for 12 weeks, with the sole focus on improving your Kettlebell lifting skill and making dramatic gains to lift heavier Kettlebells for more reps. Included in the Extreme Strength DVD program is 36 follow along workouts (weeks 7-12 repeat with weight modifications), a joint mobility warm up and 2 cool down routines. 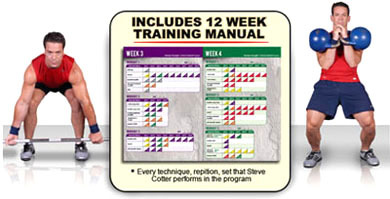 Also included is a separate in-depth instructional section where Steve teaches the fine points of every single exercises that you will be using during the entire 12 week program. This includes every Kettlebell lift and all of the barbell exercises in the program. You also receive the Extreme Strength Training Log that displays every single exercise, set count and repetition that you will be doing during the entire 12 weeks. The specifically designed training log displays all of the workouts, exercises, sets and rep counts and has a unique section to log each workouts progress.